As Amazon announced a plan to hire 100,000 temps to handle the holiday rush, the ugly truth about the horrid conditions of those who work in the company’s supply chain are being revealed. Recently, warehouse worker Jeff Lockhart Jr., a married father of three, died working at an Amazon fulfillment center in Chester, Virginia. But it isn’t just in Amazon’s warehouses that workers are suffering. Consider the story of Julio Garcia, who hauls imports for Amazon off the docks at our nation’s largest seaport – the Ports of Los Angeles/Long Beach. Click here to sign a petition to Amazon CEO Jeff Bezos to respect the workers in Amazon’s supply chain. How could this be? 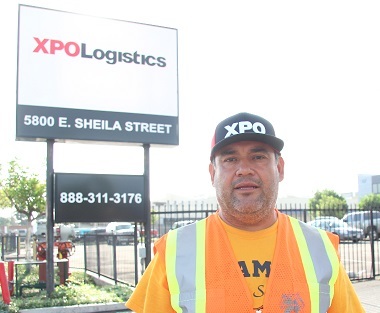 Julio Garcia drives full-time for one of Amazon’s contractors, a giant company called XPO Logistics that is valued at more than $2.5 billion. XPO, like thousands of similar American corporations, engages in an employment scheme that leaves his family unable to show a “stable” income despite “stable” work by treating its workers as employees but paying them as “independent contractors.” This scheme not only allows them to avoid payroll taxes, but also lets the company deduct their business expenses from drivers’ paychecks. The company charges the drivers to drive the company truck, charge them to register, insure, fuel, and maintain their truck, and they even charge drivers to park the company trucks at the company yard! “There are weeks that they charge me so much that I make less than the minimum wage – and some weeks I owe the company for the privilege of working for them,” said Julio Garcia. This is wage theft and it is illegal, so Julio Garcia is one of more than 700 professional truck drivers in California who have filed a claim with the state Labor Commissioner. This week, he and his coworkers delivered a petition with a list of their demands. It’s fallen on deaf ears, so XPO drivers are again on strike – their 8th strike in the last two years. P.S. Support us by signing this petition demanding changes from employer XPO Logistics.